Cossignani, T., 2018. 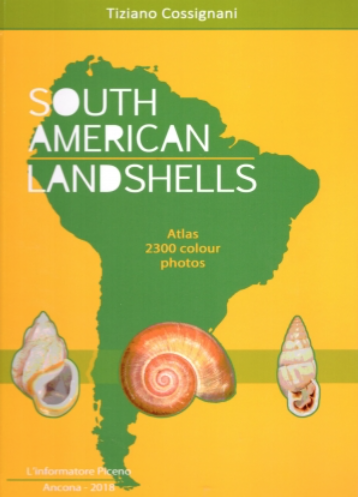 South American Landshells: 1-240. L’informatore Piceno, Ancona. ISBN 978 888 6070 35 5. Price € 120,00 net. South America is a large continent, with thousands of land snails. Several books covering specific countries and aimed at a more general readership and checklists for some other countries do already exist (Ramirez et al., 2003; Simone, 2006; Massemin et al., 2009; Linares & Vera, 2012). Therefore the publication of Cossignani’s book seems a useful addition to the literature as no one has ventured before to cover the land snails of this continent as a whole. The author’s foreword of this atlas, together with 2300 colour photos makes clear that these pictures are, for the greater part, from the collection in the Museo Malacologico Piceno, with additional photos from friends, collectors, traders and museums. The author states to have no claims to present scientific reviews or validation of any kind, and the work is essentially aimed at land shell collectors, although several freshwater snails and mussels are also included. The book is alphabetically ordered by country (all except Guyane, Suriname and French Guiana), and for each country species are arranged alphabetically according to genus. For each species the following data are presented: the author and year, place of origin of the specimen photographed, measurement in mm, and museum depository in case of type material. A brief bibliography and an index to species names complete the book. Despite the author’s assertion that he “deliberately neglected those malacological areas for which there are recent and valid publications, Brazil in particular”, pages 58-114 are dedicated to this country. This is a serious duplication of Simone’s book, which offers the same information but in a better taxonomical way. In Cossignani’s book the reader is at loss to which family a species belongs, and related genera are not grouped together as the alphabetical order does not allow this. The photos are of good quality and generally show at least two different views. Often the same species is represented by several sets of photos. Although this may be useful for species with a variable morphology (e.g., colour pattern), the degree of redundancy is disturbing when several sets of similar shells are presented. The value of a book like this depends undoubtedly on a correct nomenclature. And although this does not necessarily mean that the latest scientific insights have to be reflected, a consistent and rather up to date taxonomy would be necessary. For some groups this seems to be correct but for others there is much doubt. I do not pretend to have knowledge of all families of South American land snails. But for those belonging to the Orthalicoidea I spotted several grave errors. E.g., on page 120 Bothriembryon reflexus is mentioned for the Chilean fauna; however, this species does not belong to this Australian genus but to Plectostylus which is treated on page 123-126. Some species are mentioned with different genera (azulensis on page 13 with Bostryx, on page 20 with Discoleus; only the latter is correct). Several species are associated with the wrong fauna (to mention only the most striking ones: Bostryx nigropileatus does not occur in Argentina but in Peru; Porphyrobaphe iostoma not in Chile but in Ecuador). Some species have outdated nomenclature (e.g., page 53 Helix culminea and Helix hygrohylaea) or are assigned to a wrong genus (e.g., Bulimulus catlowae [sic, catlowiae] from Ecuador is in fact Naesiotus quitensis). Placostylus malleatus is mentioned for the Colombian fauna, but is in fact a species from the Fijian islands. Also several typos were found in species names. Some years ago Cossignani published a similar book on African snails, for which I heard very mixed stories especially about the quality of the nomenclature. I am afraid that the author has made similar mistakes this time. After several countries a checklist is given of all or part of the families. These lists appear partly copied from the internet, some are given without source; almost all are undated. The credibility of these lists is thus disputable. And it may be clear: the author has only treated part of the land snail fauna (e.g., 8% of the Colombian and 25% of the Peruvian terrestrial species). The title of the book remains far too ambitious! Despite the mentioning of museum abbreviations with photos taken from their websites (and sometimes not mentioning these abbreviation), I spotted several photos which seem to have been taken from the literature without giving credit to the original authors. The statement in the colophon that all photographs, except mentioned otherwise, have been taken by the author thus cannot be true. This book could have filled a real gap if it would have been set up in a systematic way. And if more effort had been given to illustrate available type material (with proper credits). Now it is a garbage can full of misidentifications, wrong assignments, redundant pictures and lists of doubtful usage. But my main concern is that this book leads the target group of “land-shells collectors” too often in the wrong way. The overall impression of this book is unfortunately too bad and I cannot recommend Cossignani’s work, despite the fact that it has some useful elements. Linares, E.L. & Vera, M.L., 2012. Catálogo de los moluscos continentales de Colombia. Bogotá (Instituto de Ciencias Naturales): 1-360. Massemin, D., Lamy, D., Pointier, J.-P. & Gargominy, O., 2009. Coquillages et escargots de Guyane / Seashells and snails from French Guiana. Mèze (Biotope) / Paris (Muséum nationale d’Histoire naturelle): 1-456. Ramirez, R., Paredes, P. & Arenas, J., 2003. Moluscos del Perú. – Revista de Biología Tropical, 51 (Supplemento 3): 225-284. Simone, L.R.L., 2006. Land and freshwater molluscs of Brazil. São Paulo (EGB, Fapesp): 1-390. This entry was posted in Uncategorized and tagged literature, varia on June 8, 2018 by bramb.